4-Marion Elizabeth Murray was born about 1822 in Edinburgh, Midlothian, Scotland and died on 8 May 1894 in Keilambete Villa, Seymour Avenue, Malvern, Victoria at age 72. 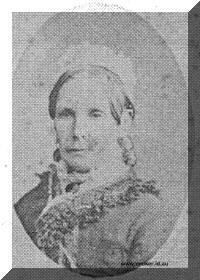 Marion married John Fox Williams on 1 Nov 1849 in Home of Peter Jacobs, Longford, Tasmania. John was born about 1800, died on 6 Oct 1872 in Longford, Tasmania at age 72, and was buried in Methodist Cemetery, Longford. The witnesses to the marriage of Marion Murray and John Fox Williams at the residence of Peter Jacobs were Peter Jacobs, Robert Stewart and Martha Murray (Mrs Martha Lyne). Marion Murray and John Fox Williams ran a store in Marlborough Street, Longford, Tasmania. In 1880 Marion Murray was living in a house in Marlborough Street, Longford, and, in 1881 she was living in a house at 7 Goderick Street, Longford, that belonged to an H. Price. Sometime after 1881 she moved to Victoria with some of her children. Marion Murray died of bronchitis at Keilambete Villa, Seymour Avenue, Malvern, Victoria. John Rowland Williams was born on 16 May 1851 in Longford, Tasmania. John married Elizabeth Franklin Hughes, daughter of John Franlkin Hughes and Catherine Swain, on 17 Oct 1888 in Beechworth, Victoria. Elizabeth was born in 1866 in Beechworth, Victoria. They had two children: Rowland Stanley and Marion Ethel Elizabeth. COURT OF BANKRUPTCY- In chambers. yesterday, before Jno. Whitefoord, Esq., Commissioner, the ad interim injunctions granted on the 4th inst. at the instance of the receiver, Mr Jno.Murpphy, in the estate of Rowland John Williams store- keeper, of Longford (in liquidation), to restrain certain execution creditors from taking further proceedings against the debtor were made absolute in all cases above £50. 6-Rowland Stanley Williams was born in 1889 in Malvern, Victoria. 6-Marion Ethel Elizabeth Williams was born in 1891 in Essendon, Victoria. Arthur Murray Williams was born on 18 Feb 1853 in Longford, Tasmania and died on 10 Oct 1920 in Perth, Western Australia at age 67. He was buried in Plot DC111, Wesleyan Section, Karrakatta Cemetery, Karrakatta, Western Australia, Australia, with his wife Caroline Jane Williams, his daughter Alice Jane Williams and her husband John Albert Stagg, and his wife's brother, Albert Edward Williams. Arthur Murray Williams lived in Tasmania for 34 years, in Victoria for 13 years, and in Western Australia for 20 years. Arthur was a grocer in Fremantle, Western Australia. Arthur married Caroline Jane, daughter of Thomas Williams and Sarah Fidler, on 19 Sep 1889 in Somerville, Victoria. Caroline was born on 11 Aug 1860 in Mornington, Victoria, died on 30 Jul 1944 in Fremantle, Western Australia at age 83, and was buried in Karrakatta Cemetery, Western Australia. They had six children: George Arthur, Alice Jane, Ernest Albert, Edward Murray, Alfred Augustus and Albert Edward. 6-George Arthur Williams was born in 1890 in Tyabb, Victoria, died on 20 Oct 1953 in Perth, Western Australia at age 63, and was buried in Karrakatta Cemetery, Western Australia. George married Daisy Maud Scott, daughter of Richard Scott and Amy Grace Hay Wilbow, on 11 Mar 1916. Daisy was born in Tyabb, Victoria, died in Oct 1953 in Perth, Western Australia, and was buried in Karrakatta Cemetery, Western Australia. They had three children: Brenda, Lona and Ailsa. 7-Brenda Williams was born on 6 Oct 1920 in Perth, Western Australia and died on 14 Nov 1987 at age 67. Brenda married John Francis Sweeney. John was born on 20 Nov 1916 and died on 14 Nov 1987 at age 70. They had three children: Janet Brenda, Gregory John and Francis Lyn. 8-Janet Brenda Sweeney was born on 4 Aug 1952. Janet married Simon Jeremy Harrison. They had two children: Simon and Gemma. 8-Gregory John Sweeney was born on 15 Jun 1954.Gregory married Sharon Beryl Herbert. They had four children: Blake, Nathan, Jordan and Sean. 8-Francis Lyn Sweeney was born on 18 May 1958. Francis married Jennifer Ball. They had two children: Kelsey and Nicholas. 7-Lona Williams was born on 13 Sep 1922 in Perth, Western Australia. Lona married Arthur Colin Burnell, son of Norman Leslie Burnell and Florence Maloney. 7-Ailsa Williams was born on 27 Aug 1925 in Perth, Western Australia. Ailsa married Peter Macpherson Jeffrey, son of Joseph George Jeffrey and Ernestine Wray. Peter was born on 26 Apr 1922 in Perth, Western Australia and died on 1 Feb 1990 at age 67. They had four children: Josephine Peta, James Timothy, Geraldine Lona and Paul Macpherson. 8-Josephine Peta Jeffrey was born on 14 Feb 1948 in Perth, Western Australia. Josephine married Geoffrey David Clough. They had two children: Sarah Louise and Jonathon David. 8-James Timothy Jeffrey was born on 7 Aug 1949 in Perth, Western Australia. 8-Geraldine Lona Jeffrey was born on 24 May 1951 in Perth, Western Australia. Geraldine married Neil Thomas Campbell on 1 Jun 1991. They had one son: Peter Jeffrey. 8-Paul Macpherson Jeffrey was born on 30 Nov 1956 in Perth, Western Australia. Paul married Anna Camalina Scarpone on 17 Sep 1993. They had two children: Karli Ailsa and Amy Teresa. 6-Alice Jane Williams was born on 21 Nov 1892 in Somerville, Victoria and died on 10 May 1960 in Fremantle, Western Australia at age 67. Alice married John Albert Stagg, son of Charles Stagg and Annie Flett, on 8 Mar 1913 in St Johns Church, Fremantle, Western Australia. John was born on 22 Jun 1889 in Orbost, Victoria, died on 13 May 1968 in Mount Lawley, Western Australia at age 78, and was buried in Karrakatta Cemetery, Western Australia. They had five children: Roy Albert, Harold Arthur, Daisy Ray, Elizabeth May and Alan John. 7-Roy Albert Stagg was born on 4 May 1913 in Fremantle, Western Australia. Roy married Kathleen Lillian Hammond, daughter of Daniel Hammond and Florence Ellen Chandler, on 15 Jul 1939 in St John's Church, Fremantle, Western Australia. Kathleen was born on 30 Aug 1915 in Cottlesloe, Western Australia. They had three children: Kaye Lynette, Roy Arthur and Cheryl Anne. 8-Kaye Lynette Stagg was born on 23 Mar 1944 in Fremantle, Western Australia. Kaye married Kevin Peek. Kevin was born on 21 Dec 1947. They had three children: Ella Louise, Alice Jane and Frances. 9-Ella Louise Peek was born on 25 Sep 1974 in Surrey, England. 9-Alice Jane Peek was born on 19 Aug 1977 in Surrey, England. 9-Frances Peek was born on 2 Dec 1983 in Perth, Western Australia. 8-Roy Arthur Stagg was born on 26 Oct 1945 in Fremantle, Western Australia. Roy married Carol Ann Harvey. Carol was born on 11 Sep 1947. They had two children: Shane Arthur and Jody Anne. 9-Shane Arthur Stagg was born on 1 Nov 1971. 9-Jody Anne Stagg was born on 27 Dec 1973 in Western Australia. Jody married Mark John Ascic, son of Marko Ascic and Anna, on 16 Oct 1993 in Church of Christ the King, Beaconsfield, Western Australia. 8-Cheryl Anne Stagg was born on 5 Dec 1949 in Fremantle, Western Australia. Cheryl married Trevor George Spencer. Trevor was born on 21 May 1949. They had three children: Louis, Elliott Hammond and Phoebe. 9-Louis Spencer was born on 23 Sep 1975 in England. 9-Elliott Hammond Spencer was born on 30 May 1978 in Surrey, England. 9-Phoebe Spencer was born on 19 Jul 1985 in Western Australia. 7-Harold Arthur Stagg was born on 19 Sep 1914 in 179 Sewell Street, East Fremantle, Western Australia and was christened on 29 Jan 1922 in St John's Church, Fremantle, Western Australia. Harold was a truck and crane driver. Harold married Margaret Amelia Ross, daughter of George Ross and Annie Dixon, on 26 Apr 1941 in St Johns Church, Fremantle, Western Australia. Margaret was born on 2 Jun 1918 in Tynemouth, Northumberland, England. They had four children: Lorraine Joy, Maureen Adele, Yvonne Margaret and Hayden Arthur. 8-Lorraine Joy Stagg was born on 15 Nov 1944 in Fremantle, Western Australia. Lorraine married Norman Kenneth Kennedy, son of Edwin Kenneth Kennedy and Ruby Courtenay, in 1998. Norman was born on 2 Jul 1942 in Sandringham, Victoria. They had two children: Sandra Lee and Michelle Joy. 9-Sandra Lee Kennedy was born on 14 Dec 1961 in Fremantle, Western Australia. 9-Michelle Joy Kennedy was born on 16 Jun 1966 in Fremantle, Western Australia. 8-Maureen Adele Stagg was born on 29 Apr 1948 in Fremantle, Western Australia. Maureen married John Apostles, son of Peter Apostles and Marie Chriton, on 3 Mar 1973 in Perth, Western Australia. John was born on 28 Nov 1950 in Kondinin. They had three children: Matthew Peter, Maree Margaret and Paula Jane. 9-Matthew Peter Apostles was born on 16 Oct 1976 in Subiaco, Western Australia. 9-Maree Margaret Apostles was born on 4 Nov 1978 in Subiaco, Western Australia. 9-Paula Jane Apostles was born on 6 May 1890 in Subiaco, Western Australia. 8-Yvonne Margaret Stagg was born on 15 Aug 1951 in Fremantle, Western Australia and was christened on 2 Sep 1951 in St. John's Church, Fremantle. Yvonne married Peter Forbes Stephen, son of Allan Dawson Stephen and Joan Morice Doyle, on 24 Jan 1976 in Floreat, Western Australia. Peter was born on 4 May 1950 in Victoria. They had two children: Shane Allan and Kristy Ann. 9-Shane Allan Stephen was born on 26 Aug 1981 in Attadale, Western Australia. 9-Kristy Ann Stephen was born on 20 Sep 1984 in Attadale, Western Australia. 8-Hayden Arthur Stagg was born on 26 Nov 1956 in Fremantle, Western Australia and was christened on 23 Dec 1956 in St. John's Church, Fremantle. Hayden married Ann Catherine Brauer, daughter of Francis Brauer and Doris, on 10 Mar 1984 in Epping, New South Wales. Ann was born on 18 May 1958. They had five children: Richard Arthur, Matthew John, Luke Joseph, Benjamin Michael and James Robert. 9-Richard Arthur Stagg was born on 16 Jan 1988 in Fremantle, Western Australia. 9-Matthew John Stagg was born on 15 Nov 1991 in Attadale, Western Australia. 9-Luke Joseph Stagg was born on 5 May 1993 in Attadale, Western Australia. 9-Benjamin Michael Stagg was born on 2 Oct 1994 in Murdoch, Western Australia. 9-James Robert Stagg was born on 16 Aug 1996 in Murdoch, Western Australia. 7-Daisy Ray Stagg was born on 2 Sep 1916 in Fremantle, Western Australia, was christened in St. John's Church, Fremantle, and died on 26 Jul 1991 in Bicton, Western Australia at age 74. Daisy married Clement Booth, son of George Arthur Booth and Jessie Willis, on 11 Dec 1937 in St. John's Church, Fremantle. Clement was born on 20 Dec 1914 in Fremantle, Western Australia and died in Western Australia. They had six children: Shirley Anne, Robert Alan, Lois Cynthia, Kenneth William, Douglas Clement and David George. 8-Shirley Anne Booth was born on 15 Dec 1938 in Fremantle, Western Australia. 8-Robert Alan Booth was born on 11 Jun 1942 in Narrogin, Western Australia. Robert married Roslyn Ann on 20 Dec 1967 in Western Australia. Roslyn was born on 30 Sep 1946. They had two children: Dianne Carol and Susan. 9-Dianne Carol Booth was born on 1 Jun 1970. 9-Susan Booth was born on 29 Apr 1971. 8-Lois Cynthia Booth was born on 28 Nov 1945 in Fremantle, Western Australia. Lois married Leonard Gordon Hockley on 10 Jul 1962 in Western Australia. Leonard was born on 19 Apr 1941. They had three children: Janine, Raymond Gordon and Annette. 9-Janine Hockley was born on 29 Feb 1964. Janine married Daymon Joseph. They had two children: Elyce and Benjamin. 10-Elyce Joseph was born on 29 Mar 1993 in Attadale, Western Australia. 10-Benjamin Joseph was born on 14 Apr 1995 in Attadale, Western Australia. 9-Raymond Gordon Hockley was born on 2 May 1965. 9-Annette Hockley was born on 27 Jul 1969. 8-Kenneth William Booth was born on 11 Jan 1949 in Fremantle, Western Australia. Kenneth married Beverley Lynette Foreman on 7 Jan 1976 in Western Australia. Beverley was born on 8 Jan 1947. They had three children: Simon Andrew, Janelle Dorothea and Merrilyn Rae. 9-Simon Andrew Booth was born on 4 May 1978. 9-Janelle Dorothea Booth was born on 2 Jan 1980. 9-Merrilyn Rae Booth was born on 2 Jan 1980. 8-Douglas Clement Booth was born on 6 Sep 1953 in Fremantle, Western Australia. Douglas married Claire Francis Cummings on 14 May 1977 in Western Australia. Claire was born on 9 Jan 1955. They had one daughter: Maree Lecia. 9-Maree Lecia Booth was born on 23 Oct 1981. 8-David George Booth was born on 13 Mar 1957 in Fremantle, Western Australia. 7-Elizabeth May Stagg was born on 15 Aug 1920 in Fremantle, Western Australia, died on 1 Dec 1960 in Fremantle, Western Australia at age 40, and was buried in Karrakatta Cemetery, Western Australia. Elizabeth married Robert James Williams, son of Robert James Williams and Ellen Julia Wright, on 15 Feb 1941 in St. John's Church, Fremantle. Robert was born on 11 Nov 1921 in Freckenham, Suffolk, England and was buried in Karrakatta Cemetery, Western Australia. They had four children: Rae Lynette, Carol Anne, Christine Nola and Robert James. 8-Rae Lynette Williams was born on 11 May 1944 in Freckenham, Suffolk, England. Rae married Reginald Robert Mustard in Mar 1971 in Western Australia. Reginald was born on 8 Aug 1945. They had two children: Lance Robert and Narelle Anne. 9-Lance Robert Mustard was born on 24 Oct 1975. 9-Narelle Anne Mustard was born on 16 Feb 1980. 8-Carol Anne Williams was born on 7 Sep 1947 in Fremantle, Western Australia. Carol married Peter Francis Evans. Peter was born on 14 Nov 1946. They had four children: Rachel Kim, Karinda May, Roxanne Lee and Brendon William. 9-Rachel Kim Evans was born on 20 Aug 1973. 9-Karinda May Evans was born on 13 Sep 1974. 9-Roxanne Lee Evans was born on 10 Jun 1975. 9-Brendon William Evans was born on 27 Aug 1981 and died on 28 Aug 1981. 8-Christine Nola Williams was born on 22 Dec 1951. Christine married Harvey Vincent Robinson. Harvey was born on 27 Dec 1950. They had three children: Bradley Wayne, Jeffrey Vincent and Tanya Noeline. 9-Bradley Wayne Robinson was born on 11 Nov 1970 in Perth, Western Australia. Bradley married Helen Louise Tenthy. Helen was born on 31 Oct 1972 in Darwin, Northern Territory. They had two children: Benjamin Bradley and Grace Anne. 10-Benjamin Bradley Robinson was born on 6 May 1997 in Perth, Western Australia. 9-Jeffrey Vincent Robinson was born on 6 Dec 1972 in Perth, Western Australia. 9-Tanya Noeline Robinson was born on 27 May 1978 in Darwin, Northern Territory. 8-Robert James Williams was born on 1 Jun 1954 in Fremantle, Western Australia. Robert married Julie Adams. Julie was born on 27 Feb 1959 in Western Australia. They had two children: Chantelle Marie and Michael Anthony. 9-Chantelle Marie Williams was born on 15 Apr 1976. 9-Michael Anthony Williams was born on 28 Feb 1980. 7-Alan John Stagg was born on 7 Mar 1930 in Western Australia. Alan married Dulcie Rose Bowra, daughter of William Henry Bowra and Rosina Amanda Hann. Dulcie was born on 13 Dec 1933. They had three children: Suzanne Margaret, Desmond John and Patricia Rose. 8-Suzanne Margaret Stagg was born on 27 Feb 1954 in Western Australia. Suzanne married David Edgar Mustard on 1 May 1974 in Western Australia. David was born on 15 Mar 1953. They had two children: Daniel Alan and Benjamin David. 9-Daniel Alan Mustard was born on 25 Jul 1979. 9-Benjamin David Mustard was born on 28 Aug 1981. 8-Desmond John Stagg was born on 1 May 1955 in Western Australia. Desmond married Angela Frances O'Rourke on 20 Nov 1983. Angela was born on 9 Nov 1950. They had two children: Andrew and Sonia Elaine. 9-Andrew Stagg was born on 25 Jun 1967. 9-Sonia Elaine Stagg was born on 25 Jun 1974. Sonia married David Candeloro on 23 Sep 1995. They had one son: Jacob. 10-Jacob Candeloro was born on 13 Jul 1997 in Western Australia. 8-Patricia Rose Stagg was born on 7 Oct 1956 in Western Australia. Patricia married Richard Eric Sims on 8 Mar 1980 in Western Australia. They had three children: Nicholas Richard, Lucas and Stephanie Rose. 9-Nicholas Richard Sims was born on 13 Feb 1994 in Subiaco, Western Australia. 9-Lucas Sims was born in 1996 in Western Australia. 9-Stephanie Rose Sims was born on 28 Jan 1998 in Murdoch, Western Australia. 6-Ernest Albert Williams was born in 1894 in Hastings, Victoria and died on 20 Jul 1960 in Midland Junction, Western Australia at age 66. Ernest married Ruby May Sandberg, daughter of John Sandberg and Agnes Clara Pitts, on 22 Oct 1917 in St. John's Church, Fremantle. Ruby was born on 27 Jan 1895 and died on 13 Feb 1979 in Subiaco, Western Australia at age 84. They had four children: Gloria May, Gordon Ernest, Clifford Murray and Laura Gwen. 7-Gloria May Williams was born on 6 Sep 1918 in East Fremantle, Western Australia, died on 22 Nov 1918 in Subiaco, Western Australia, and was buried in Fremantle Cemetery, plot Mon A 681. 7-Gordon Ernest Williams was born on 18 Nov 1919 in East Fremantle, Western Australia and died on 23 Apr 2012 in Subiaco, Western Australia at age 92. Gordon married Joyce Smith. They had two children: Gail and Jill. 8-Gail Williams. Gail married Mark Young. 8-Jill Williams. Jill married Eric Grinda. 7-Clifford Murray Williams was born in 1922 in East Fremantle, Western Australia and died on 19 May 1968 in Fremantle, Western Australia at age 46. Clifford married Diana Shelley. They had six children: Janet, Terence Murray, Gaye, Patricia, Beth and Sandra. 8-Terence Murray Williams. Terence married Sandra. 8-Gaye Williams. Gaye married Keith Summers. 8-Patricia Williams. Patricia married Glenn Thomas. 8-Beth Williams. Beth married Graham Still. 7-Laura Gwen Williams was born on 12 Sep 1924 in East Fremantle, Western Australia and died on 27 Sep 2010 in Nambour, Queensland, Australia at age 86. Laura married Harold Walter Allen. They had four children: Kerry June, Lindy Margret, Kimberley John and Casey Grant. 8-Kerry June Allen. Kerry married Gary Donald Adams. 8-Lindy Margret Allen. Lindy married Michael Bartholomew. 8-Kimberley John Allen. Kimberley married Shelley. 8-Casey Grant Allen. Casey married Cheryl Perkins. 6-Edward Murray Williams was born in 1896 in Tyabb, Victoria and died on 19 Mar 1968 in Western Australia at age 72. Edward married Grace Parsons. Grace was born in 1897 and died on 19 Oct 1974 at age 77. They had four children: John, Alan, Elva and Mark. 7-John Williams. John married Ruby. They had three children: Diane Kay, John and Mark. 8-Diane Kay Williams died on 18 Dec 1991 in Wembley, Western Australia. Diane married Alan McMerrin. They had one son: Jason. 7-Alan Williams was born on 6 Jan 1935 and died in Perth, Western Australia. Alan had a daughter: Debbie. 8-Debbie Williams was born on 12 Jun 1957. 7-Elva Williams. Elva married Peter Berry. They had three children: Pauline, Elizabeth and Amanda. 6-Alfred Augustus Williams was born in 1899 in Fremantle, Western Australia. Alfred married Lilian Hogan. 6-Albert Edward Williams was born in 1901 in Fremantle, Western Australia and died on 19 Feb 1934 in Claremont, Western Australia at age 33. Marian Isabella Williams was born on 10 Sep 1854 in Longford, Tasmania, died of a cerebral tumor on 19 Mar 1918 in Wattletree Road, Malvern, Victoria at age 63, and was buried in Saint Kilda Cemetery. Marian married George Robert Campbell, son of George Campbell and Barbara Stewart, the widowed husband of her deceased sister, Christianna (Clarinda Annie) Williams in 1905 in Victoria. George was born in Ireland and died in May 1941 in Malvern, Victoria. They had no children..
Amelia Thomson Williams was born on 24 Nov 1855 in Longford, Tasmania, died on 7 Apr 1919 in Wattletree Road, Malvern, Victoria at age 63, and was buried in St. Kilda Cemetery. Amelia married Joshua Frederick Jackson on 16 Jul 1885 in Toorak, Victoria. Joshua was born in 1856 and died in 1902 in Malvern, Victoria at age 46. They had six children: Marion Irene, Lillias Charlottee, Frederick Harvey, Murray Guy, Dorothy Isabel and Naomi Millicent. 6-Marion Irene Jackson was born in 1886 in Prahran, Victoria and died in 1887 in Armadale, Victoria at age 1. 6-Lillias Charlottee Jackson was born in 1887 in Armadale, Victoria. 6-Frederick Harvey Jackson was born in 1889 in Malvern, Victoria and died in 1919 in Malvern, Victoria at age 30. 6-Murray Guy Jackson was born in 1892 in Malvern, Victoria. 6-Dorothy Isabel Jackson was born in 1895 in Malvern, Victoria. 6-Naomi Millicent Jackson was born in 1898 in Malvern, Victoria. Ernest Newton was born on 20 Jun 1857 in Longford, Tasmania and died on 6 Jun 1858 in Longford, Tasmania. 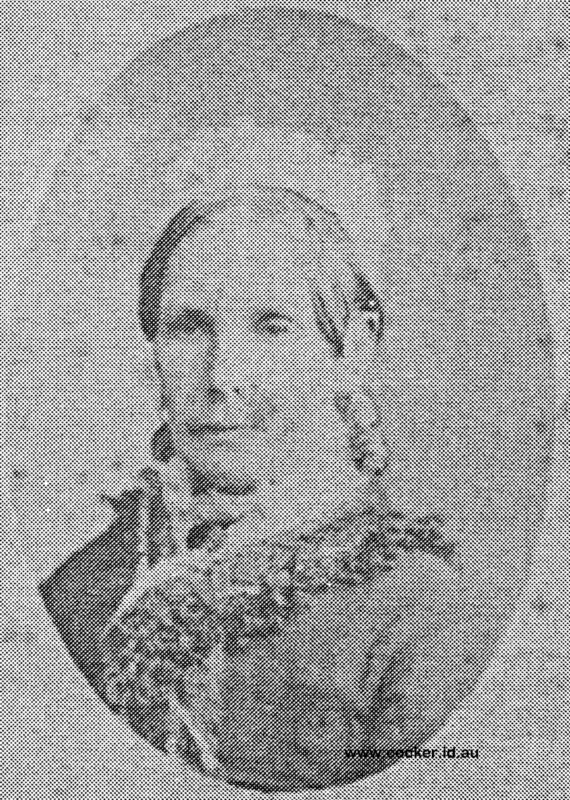 Christianna was born on 29 Nov 1858 in Longford, Tasmania and died in Sep 1900 in Malvern, Victoria at age 41. Christianna Williams Changed her name to Clarinda Annie Williams. Christianna married George Robert Campbell, son of George Campbell and Barbara Stewart, in 1889 in Malvern, Victoria. George was born in Ireland and died in May 1941 in Malvern, Victoria. They had two children: Clara Eileen and George Norman Strachan. 6-Clara Eileen Campbell was born in 1891 in Malvern, Victoria. 6-George Norman Strachan Campbell was born in 1896 in Malvern, Victoria. Alfred Augustus Williams was born on 24 Mar 1863 in Longford, Tasmania, died on 9 Oct 1943 in Sunshine, Melbourne, Victoria at age 80, and was buried on 11 Oct 1943 in Fawkner Cemetery, Melbourne. Alfred married Cornelia Victoria Corney, daughter of Robert Corney and Sarah Cox, on 10 Feb 1887 in Wesleyan Methodist Church, Prahran, Victoria. Cornelia was born in 1869 in Sydney, New South Wales. They had three children: Elsie Victoria, Augusta Ruby and Stuart Murray. 6-Elsie Victoria Williams was born in 1888 in North Fitzroy, Victoria and died in Sunshine, Borke, Victoria. Elsie married Harold Gothorp Hutchinson, son of Charles Ernest Hutchinson and Lizamin Gothorp, in 1917 in Victoria. Harold was born in 1889 in Drouin, Victoria and died in 1996 in Heidelberg, Victoria at age 107. They had one daughter: Dorothy Nell. 7-Dorothy Nell Hutchinson was born in 1918 in Violet Town, Victoria. Dorothy married Edward Alexander Renton. Edward was born in 1918 and died in 1985 in Yarra, Victoria at age 67. 6-Augusta Ruby Williams was born in 1889 in Armadale, Victoria and died in Lowe, Victoria. 6-Stuart Murray Williams was born in 1895 in Ringwood, Victoria. Albert Manton Williams was born on 2 Mar 1866 in Longford, Tasmania and died on 12 May 1866 in Longford, Tasmania.